Lot:4030 Friedberg Unlisted (W-Unlisted). 1897 $10 Silver Certificate. PCGS Currency Very Choice New 64 PPQ. Friedberg Unlisted (W-Unlisted). 1897 $10 Silver Certificate. PCGS Currency Very Choice New 64 PPQ. Face Progress Proof.Hessler-SE21. Black on India paper, mounted on wide margin paper. The signatures of Tillman and Morgan are to the lower left and right respectively. No plate letter. The central vignette features Agriculture and Forestry and is similar to the composition submitted for the Series of 1896, though the central vignette is styled somewhat differently, and there are other minor changes. 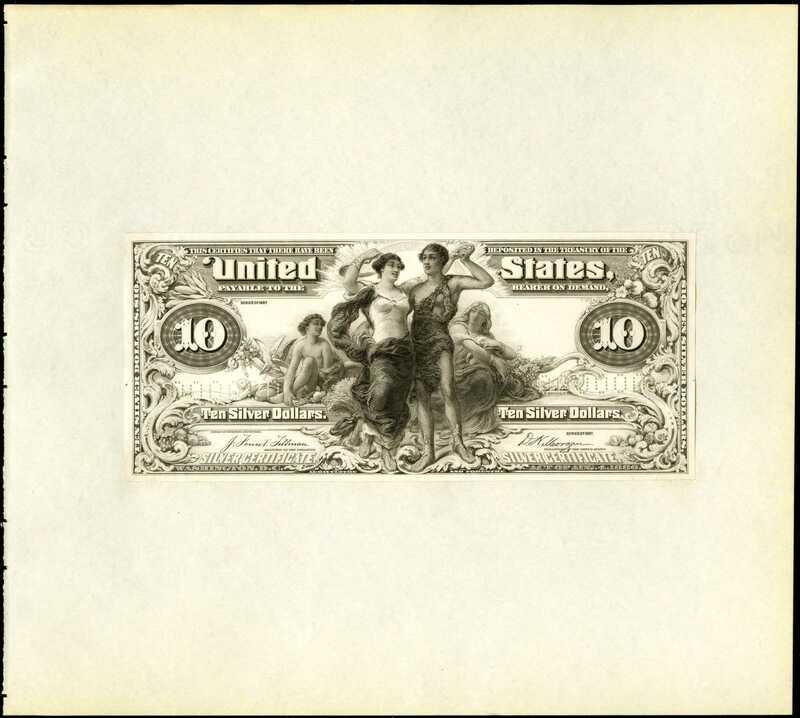 This central vignette is also used on $1000 3% coupon bonds of 1898. Superbly styled border flourishes are seen throughout. The end counters are in character with the original art piece created for proposed 1896 notes. Six zeros are perforated at left and right. This piece was last offered publicly in our 2010 Philadelphia Americana sale where it realized $32,200. Unfortunately these notes were never issued for circulation, leaving only proof examples such as this for collectors seeking a representative of the design type.From Stacks sale of September 2010, lot 1090.